China's lunar sample program involves early test this year of reentry capsule to evaluate high-speed entry into Earth's atmosphere. China's space program has set its sights on an ambitious feat of lunar exploration: robotically landing a probe on the moon and returning samples of the lunar surface back to Earth. To accomplish that, the country plans to launch a lunar "test orbiter" by year's end with the intention of laying the foundation for China's Chang'e 5 lunar sample-return mission in 2017. 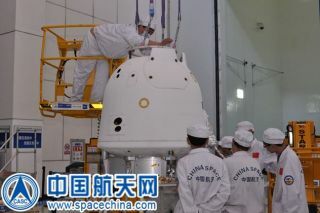 A test lunar orbiter has arrived at China’s Xichang launch site, to be hurled moonward by year's end. This recoverable moon orbiter is designed to checkout hardware for China's Chang'e 5 moon sampling mission in 2017. The test orbiter mission involves a high-speed re-entry into the Earth's atmosphere as a precursor checkout for the Chang'e 5 sample-return mission. A specially designed re-entry capsule will return from the vicinity of the moon into the Earth's atmosphere, take the heat, and then land. The Chang'e 4 moon orbiter is the backup for Chang'e 3 mission, which delivered China's first lander and rover on the lunar surface in 2013, according to China news agencies, but adapted to verify the technologies needed for the Chang'e 5 mission. Chang'e 5 artwork shows various components of China's lunar sample return mission slated for 2017. According to China's CCTV, the soon-to-be-launched probe will be placed into lunar orbit. Tests would be carried out there, with the vehicle blasting out of lunar orbit and returning to Earth. There was early speculation that this test vehicle might fly a circumlunar trajectory, rounding the moon, then hurtle the hardware Earthward to carry out the high-speed appraisal of the return capsule. But according to China's Xinhua news agency, the plan is for the orbiter to be launched into lunar orbit and return to Earth at an escape velocity of 11.2 kilometers per second. China launched the Chang'e 3 lunar lander and its Yutu moon rover in late 2013. It followed the success of the Chang'e 1 and Chang'e 2 moon orbiter missions in 2007 and 2010. "China started late in the space race. We never had astronauts in the lunar missions. But we have good technology for manned space missions. So after we are able to have probes return to Earth, we'll study and move to possible manned lunar missions," Ye Peijian, a China Academy of Space Technology senior adviser, told CCTV. Leonard David has been reporting on the space industry for more than five decades. He is former director of research for the National Commission on Space and is co-author of Buzz Aldrin's 2013 book "Mission to Mars – My Vision for Space Exploration" published by National Geographic. Follow us @Spacedotcom, Facebook and Google+. Original article on Space.com.